Why are they just singing about old things?" The traditional music of Louisiana has spawned several dynasties. Names like Ardoin, Delafose and Balfa are legend, with children and grandchildren continuing to play and disseminate Creole, Cajun and Zydeco music. With its emphasis on emotional songs and energetic dance rhythms, Cajun music has nurtured a generation of new native players, and attracted great musicians from outside the Louisiana community. Dewey Balfa was one of Cajun music's first and most beloved emissaries, bringing it to the ears of the outside world during the sixties. I was lucky enough to see a Balfa Brothers concert back then, and will not forget the warmth of the music and the man. I wearied my stereo playing the Swallow LP I had bought there. 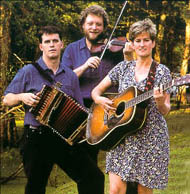 So many years later, there is a wonderful continuity in talking to Christine Balfa, Dewey Balfa's youngest daughter, who along with her husband Dirk Powell on accordion, fiddle, and vocals and Kevin Wimmer on fiddle and vocals comprise Balfa Toujours. Christine plays rock-steady, iron-fingered rhythm guitar and sings it straight and true. Both Dirk and Kevin came from different musical backgrounds. Kevin was raised on classical music, and Dirk was steeped in the Celtic/Appalachian tradition. They gravitated to Cajun music, finding in it a deep resonance. They play with finesse, fire and virtuosity. Dewey Balfa passed away six years ago, and Christine recalls "We formed the band shortly after he died. Whenever you go through a loss like that, you have to deal with it in some way. Luckily we had the music to help us. We had been around the music all the time, and never felt moved to write, but that summer we started writing a lot of songs." Balfa Toujours' latest CD is La Pointe (Rounder). It was produced by Peter Schwarz and recorded at home on analog equipment. "This is our fourth CD" says Christine, "and we had done all the others in studios, which we enjoy, but we play so much music here at home with friends and family-- you know I grew up with the music in the house, and to me that's where this music is at its best. So we thought it would be neat to capture that, take it off the stage and bring it back in the home. We thought we'd have to use more primitive equipment, but then Tony Daigle, this great engineer got involved and before you know it, he was driving to Nashville, getting vintage analog equipment and setting it up in the house-so we sort of had the best of both worlds." The best of both worlds also seems a fitting description of the band. Balfa Toujours performs core and original material, and it is to their credit that they are able to create music which is firmly rooted in tradition, but which also takes that tradition several graceful steps further. The songwriting is particularly strong. Lyrics deal with real-life issues, and real-life people. "I think it's important for each generation to add their own voice," muses Christine, "'Cause you know in a hundred years people might look back and say "Why didn't people create back then in the late-twentieth century - what happened? Why are they just singing about old things, why aren't they singing about things that happened in their time... For example these days so many parents work two jobs, they can't see their kids like they'd like too-- these things are happening today, so I was moved to write about that in the song "Restez Ma and Pa, Restez." Lyrics are one way to modernize a repertoire, but Balfa Toujours is not afraid to include musical elements that push the envelope. On "Pa Janvier," a stately showcase for twin fiddles, there is a chord passage that separates the verses and intensifies the drama of the tune. "I really like the sound of it, even though it's unusual for Cajun music to have that kind of chord progression. I think it was Peter's idea. Yet to me it still sounds like a Cajun tune, and I hope that people don't feel like we are trying to do something that isn't natural. As far as arrangements go it's a very democratic band¼ everybody gets to give their input." It is that very instinctive naturalness that makes Balfa Toujours' sorties into modernization so subtle and convincing. Unlike many unsuccessful fusions which end up as ungainly patchworks, here the augmentations heighten and extend the power of the music without changing its identity. At the same time, this is a band that can make the most stiff-necked archivist happy. Their performances of the Creole repertoire are not only faithful to the originals, but in some cases are the only current recordings available. A particular standout is "Bernadette," which highlights Kevin Wimmer's singing and playing. "I'm so glad that we did that tune." enthuses Christine. "Over the years Cajun and Creole have been interacting non-stop. I can hear the differences, but I can't explain them. We really love the old Creole stuff, and unfortunately a lot of it is being lost -- with Zydeco a lot of the young bands are not really playing the old Creole songs, which is a shame because I just love it, and there's a lot of old cool tunes." "The Freeman Fontenot medley on our CD is another example. He was an old Creole accordion player who lived a only a few miles from our house. In my dad's collection of tapes we found these old tapes of school shows where he would bring different musicians to the schools, and on one of them he brought Mr. Fontenot so we got to hear this tape and that's how we got to hear the songs--but otherwise I don't know that anyone even knows them. The only one I know who is also doing that repertoire these days is Geno Delafose. It moves me, it's so beautiful and so unique." Christine's treasure trove of tapes also yielded the opening minutes of "Marshall's Club" in which Dewey Balfa emcees a radio show broadcasting from Basille. The radio band breaks into an ultra funky dance tune, and it gradually segues into one of Balfa Toujours' current numbers. One can envision the band clustered around the faders, feeling out just the right moment; just that right blend of timing and transition. Dewey Balfa described the first time he played a concert outside Louisiana for a large audience as a great affirmation of his pride in being a Cajun. The pride that he felt is carried on today by Balfa Toujours, but there's something more. Derek's closing piece, "Un Ange Pour Tout La Louisiane," describes hearing a beautiful song sung by an unidentified girl ("Maybe she was Indian, Maybe she was Creole or Cajun"). It is an homage to the richness of the cultural mix in Louisiana. In their own material, and in their collaborations with Geno Delafose and Bois-Sec Ardoin, Balfa Toujours are promoting respect, appreciation, and unity through music. Dewey would approve. Michal Shapiro is a recording producer and freelance writer from New York. The Real Audio song, "Kingpin Special," is written by Dirk Powell, from the album La Pointe. © 1998 and used with the express permission of the artists and Rounder Records.